The morning of November 30, while in mid-conversation with my husband about the odd behavior of the dogs, the world shook us off our feet. As dishes, dry goods, and belongings flew out of cabinets, and the power went out, I grabbed the dog and bolted toward the door. The earth was shaking so violently that we could not help but bang into walls, sinks, benches to get outside and witness the trees swaying violently in the windless pre-dawn sky. For over 90 seconds, the world bucked and rocked in more directions than imaginable, bringing on nausea from motion sickness. An emergency message arrived via cell phone with a Tsunami Warning for our area with immediate instructions to seek higher ground. This warning was automatically generated due to the magnitude of the earthquake and our location and fortunately was rescinded a short time later after no evidence of a wave was observed. 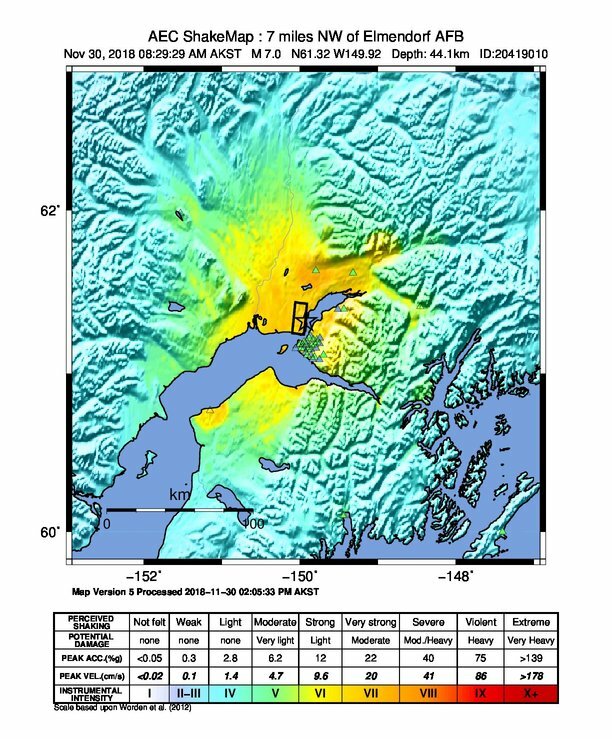 We later found out that the magnitude 7.0 earthquake’s epicenter was about 20 miles from our location. Now that the initial madness of that morning is behind us, and we have cleaned up the broken glass and mess, some key lessons have formed that may be useful for others who may experience an earthquake while on the road. While generally, RVs are better equipped to withstand movement than foundation structures are, there really is no way to describe the motion and violence of a large magnitude earthquake. Unlike hurricanes, tornadoes, blizzards, and other natural disasters, there is not any accurate warning system of an impending earthquake. Based on our experiences, and after speaking with the USGS National Earthquake Information Center, here are some tips to consider. Know if you are in an area prone to large-scale seismic events, such as earthquakes or tsunamis. In the US this generally includes western coastal states (Alaska, Washington, Oregon, California, Hawaii), but also includes mountain states like Montana, Idaho, and Utah; and the 5.8-magnitude 2011 Virginia earthquake also shows the potential is everywhere. If you are near the coast and lower than 150 feet elevation, tsunami events (even from across an ocean) may be possible. Ocean levels are monitored, so some advance warning of an inbound tsunami may be possible, such as the warning we got on our cell phone. Be aware of where you are parked and how you got to that location. A nice shady tree could become a hazard during an earthquake. Overhead power lines, steep hills/rock outcrops, bridges, and buildings can all pose debris hazards or evacuation route hazards after an earthquake. 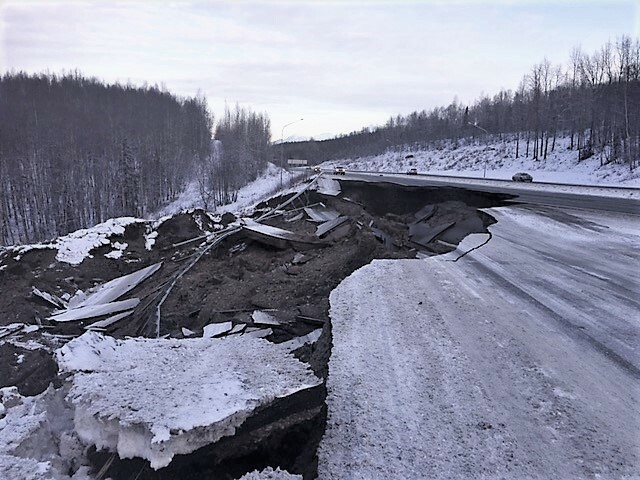 During the Alaska quake, several roads and bridges were damaged and traffic in and out of the Anchorage area came to a standstill for hours. Always secure cabinets, drawers, overhead items, and fridge doors. Everything got knocked from where it was, creating a huge hazard of broken glass, dishes, cans, and items that we had to negotiate in the dark. Make sure you have adequate fire extinguishers and that they are maintained and current. Fire is one of the biggest threats after an earthquake as gas and power lines are often down and leaking. Every RVer should have fire extinguishers on hand, but when was the last time you checked to be sure yours is current and functional? Be prepared to “dry camp” for 72 hours or longer. Have extra food, water, first aid, prescription medications, batteries, fuel, and personal hygiene items on hand. With large-scale incidents like an earthquake, it will take emergency responders a much longer time to get to you than normal. Especially if there are critical emergencies or road damage. Be ready to take care of yourself for an extended time. Don’t forget your pets – extra food and supplies for them as well! Check with your insurance agent to see if damage from an earthquake is covered with your policy. This is just good to know. If you are driving during the earthquake, it may feel like something significant is happening to your rig. Friends reported their trailers started to jackknife or that it felt as if a tire had blown. One driver reported airbags going off while driving. Try to get to the side of the road and stop if you can! Be aware that other drivers may also be having trouble, and keep in a safe location. Take care with your hands, feet, and head. Many injuries happen after the earthquake as people try to evacuate and don’t have adequate protection from falling and broken objects. Minor cuts can get infected and lead to more significant issues. Don’t take chances, find your shoes, work gloves, and be aware of items that may yet fall from elevated places. As soon as you can safely, check your jacks, hookups, gas lines, propane tanks, etc for damage. Turn off anything that could cause a hazard. Also survey surrounding utilities (power lines, gas lines, water lines, etc) that may have been damaged and could cause fires or flooding. Be ready for aftershock earthquakes. It seemed as though the earth never stopped moving for at least 24 hours after the initial big quake happened. Even now, 5 days after the initial earthquake, we are still experiencing aftershocks big enough to wake us up and rattle the shelves. The USGS has registered over 2,000 aftershocks (over 50 at magnitudes 4 or higher) and predicts that although the shaking will gradually decrease with time, it could be months before things settle down to “normal”. Falling objects and damage may continue to occur during these larger aftershocks. Expect to be rattled. Pardon the pun, but the emotional toll of the prolonged exposure to adrenaline is not insignificant. The mental stress of the lengthy ground movements will affect humans and animals as well. Aftershocks may keep you awake, and lack of sleep also wears on emotions. Evaluate your route options for getting out. You may want to just get out of Dodge, or you may need to evacuate for another reason, but try to assess your route options, avoiding areas like bridges that may be damaged. It is unlikely that you will ever experience an earthquake similar to the one we just had, but these precautions and observations may be useful in any number of unplanned situations you may confront. Please feel free to add from your own knowledge as well! This article dances around and obfuscates the key concept: An RV has the potential to be a lifesaver in times of emergency, but only if set up for boondocking and preferably 4 season operation. Unfortunately, few of them are. One other thing – not just for earthquakes – always keep a flashlight nearby. I have a Maglite solitaire on my keychain, and it’s my first line of defense when it comes to emergency equipment. A flashlight enables you to see your way to all the other emergency equipment you might have. Thank you for taking the time to share your experience with RVers, TC. We often think we can just avoid natural disasters since we are mobile. But the 1959 Hebgen Lake Earthquake proved that assumption false. At least 27 campers died in the earthquake-created landslide that buried a Forest Service campground near West Yellowstone, Montana. One of the more sobering visitors centers near Yellowstone NP is at Quake Lake, where this 7.3 magnitude event and its aftermath is memorialized. 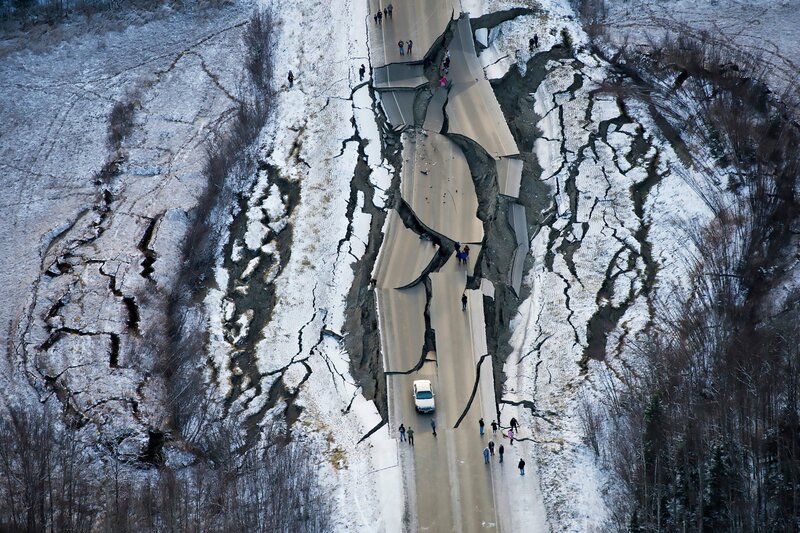 We live 1/2 mile from the location of the photo (Vine Rd, Wasilla Alaska). Boy, did we ever shake! I soon realized our RV was way better prepared than our home was (bad on me – this IS earthquake country). With power and water out, and still dark out at 8:30am in AK), we gathered the pets up and high-tailed it out to the RV until light. Yikes! I live in California, which allot of us have seen Fires, and earthquakes etc. it’s always a good idea to be prepared not only in your home, but your RV if there is a fire, or earthquake…. Make sure you grab your Kids, Animals, and there is plenty of Gas in your Rv To get Out Fast or if your in a traffic jam. Remember when Electricity goes out, Gas station pumps do not work.